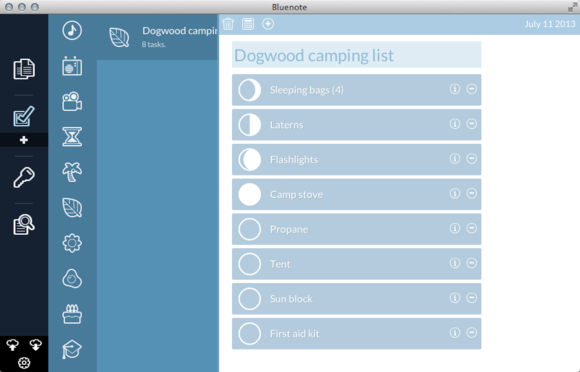 As a place for written notes, to-do lists, and passwords, the $2 Bluenote (Mac App Store link) is nowhere near as robust as an app like Evernote ( ). But if you’re always using OS X’s Notes app and you’d like an app with a basic security feature, Bluenote could be what you need. Bluenote’s most important feature is that it requires a password every time you use it. The data stored in Bluenote and the backups of your Bluenote data are encrypted, according to the developer. If you lose your password, Bluenote can’t recover it; you have to reset the app (instructions are on the developer’s website) and then restore your data using a backup. Bluenote can store its data to Dropbox so you can use Bluenote on other Macs and have access to the same data. But the developer doesn’t have an iOS app, so you can’t access your Bluenote information on your iPhone or iPad. The only thing you can really do with any notes you’ve written in Bluenote is stylize the text with a few basic formats: bold, italic, underline, strikethrough, and list. 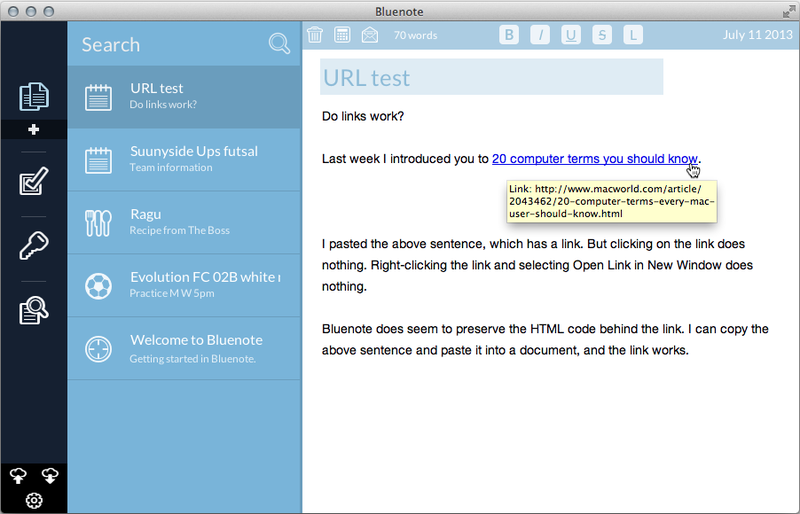 You can’t add images or use Web links, limitations that prevent Bluenote from being a place for storing research or detailed notes (you can use images and paste in links in OS X’s Notes, though I still won’t use Notes for research). Notes in Bluenote are built for text only. 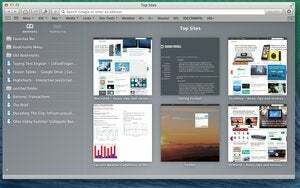 No images, no working URLs. You can send a note as an email with the simple click of the email button, but if you’ve done a lot of cutting and pasting from websites, your email message will annoyingly have ASCII codes in place of some characters or spaces. You can’t export your notes for use in other apps, but since Bluenote notes are just text, you can copy and paste the note into a new document as a workaround. Notes also has a calculator feature where you can write out a simple equation (for example, 500+500), select it, click the Calculator icon, and the math is done for you. 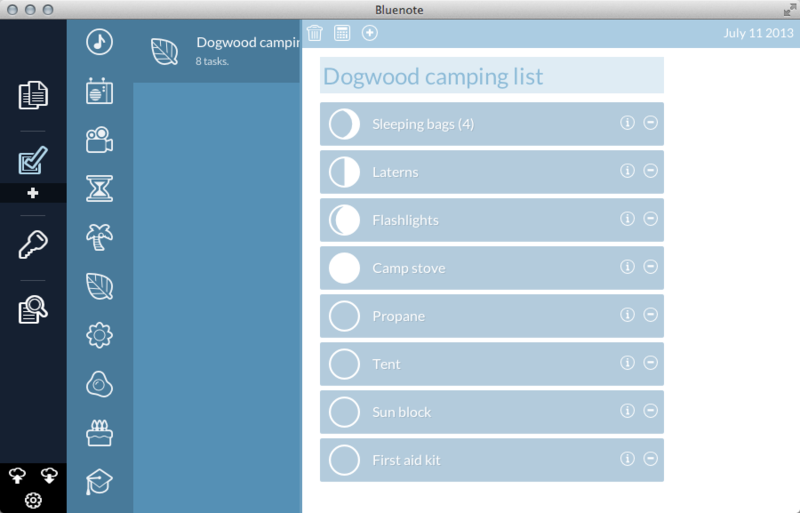 Bluenote’s Tasks can be used to create to-do lists, shopping lists, or any other type of check list. What’s nice about Bluenote's checkbox entry is that the box itself isn’t a simple checkbox that’s marked or not marked with an X; it’s a circle that has four stages of filler. For example, if you have a to-do list and you’re halfway done with a task, you can fill the circle halfway. It’s a good way to quickly remind yourself of how much work you need to do for a particular task. Bluenote has a large collection of icons for quickly identifying Bluenote content. Unfortunately, Bluenote doesn’t tie into any type of notification system (like Growl or OS X’s Notifications), so you can’t set a Bluenote task to alert you in case you’re on a deadline. 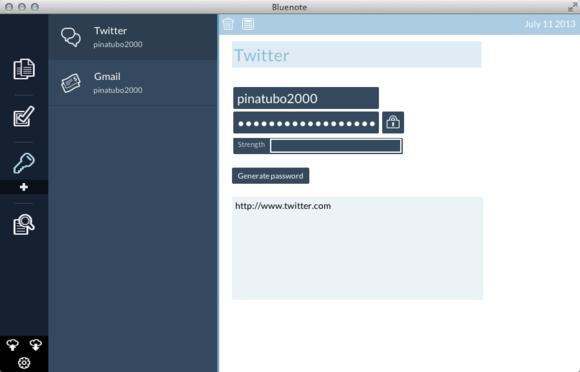 User names and passwords can be stored in Bluenote, and the Password section gives you handy entry points for entering such data. The app will even generate passwords and indicate the strength level of your password. Bluenote doesn’t plug in your information for you when you are about to log into an account on the Web. It’s strictly for storage of user name and password info. Bluenote does encrypt its data, so you might consider using it as a secondary backup location. Bluenote won't replace a password management app like 1Password or even a free password manager website like Clipperz.com. If you’re frequently writing in Notes, Bluenote may be worth the $2 fee for the ability to password protect your data and have it encrypted. Bluenote doesn't have a lot of features, and for some people, that's OK—more features just get in the way, and Bluenote doesn't encumber the user. But some people—like me—need features that aren't found in Bluenote, and will turn to other apps. If you're looking for a simple place to store notes, passwords, and to-do lists—something that's slightly above OS X's Notes app—Bluenote could work for you.